On Monday Buffalobills.com writer Canio Marasco wrote about the Buffalo Bills’ desire get Lorenzo Alexander back on the edge and someone else at Sam linebacker. Marasco believes that second year linebacker Reggie Ragland is one of the top candidates for that job. Ragland was the team’s second round pick in 2016 and missed his entire first year due to a shoulder injury. In his last year at Alabama, Ragland graded as the seventh best off the ball linebacker in FBS with a grade of 87.8. 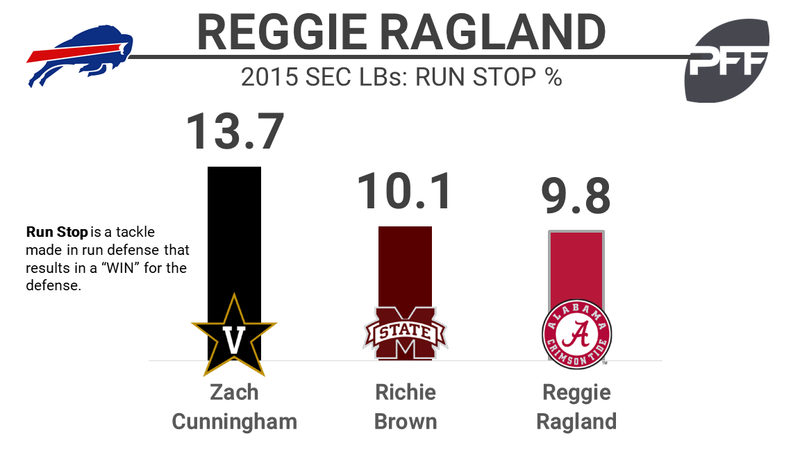 During that final year of college Ragland was solid against the run and in coverage. His 9.8 run-stop percentage ranked third among 20 qualifying SEC inside linebackers. In coverage he allowed a catch rate of 65.2% which ranked sixth. His coverage grade of 85.0 ranked 26th among all FBS linebackers.